Every day, Watch This offers staff recommendations inspired by a new movie coming out that week. This week: The Texas outlaw saga Ain’t Them Bodies Saints has us thinking back on some of our favorite on-the-lam movies. 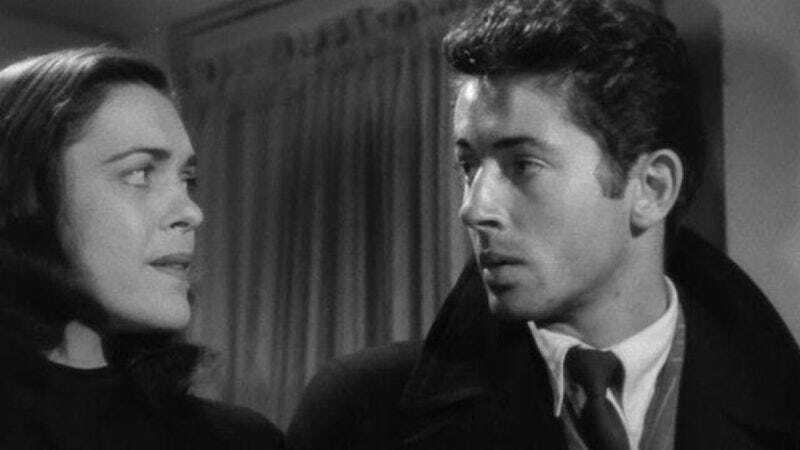 “This boy… and this girl… were never properly introduced to the world we live in.” With those words, superimposed over images of Farley Granger and Cathy O’Donnell tenderly kissing, Nicholas Ray’s masterpiece They Live By Night—his debut feature, incredibly—declares its allegiance to poetry rather than realism, which is what sets it apart from the dozens of lovers-on-the-lam pictures that would follow in its footsteps. (Decades later, Robert Altman would direct his own adaptation of the same source novel, Thieves Like Us.) The film’s story is simple, even skeletal: After busting out of jail, Granger meets a nice (if unusual) girl, O’Donnell, and makes a concerted effort to go straight, which circumstances continually prevent. But Ray inflects every aspect of this primal, tragic narrative with overpowering strangeness and beauty, creating a private world for the couple that reinforces that arresting opening statement. Some of this effect was accomplished simply by doing things nobody had thought to do before—by some reckoning, They Live By Night is the first movie that used a helicopter to shoot actors performing, as opposed to merely an establishing landscape. The film shares with Citizen Kane the sense of a born director reinventing the medium on the fly, with reckless, thrilling disregard for its established conventions. Basic close-ups are frequently shot at slightly odd angles that emphasize the characters’ emotional fragility, and both Granger and O’Donnell give heavily stylized performances that don’t resemble what any other actor was doing in the 1940s—O’Donnell’s spacey demeanor, in particular, seems to anticipate Sissy Spacek. Together, with Ray’s masterful assistance, they convey the sense of two people thrust into a situation they don’t understand, improvising wildly until there’s nowhere left for them to run. It’s a précis of the human condition, in other words—beguiling and heartbreaking. Availability: A double-feature Warner Bros. DVD (with Anthony Mann’s Side Street, also starring Farley Granger), which can be obtained through Netflix’s disc-delivery service.